Heavenly blog! : No. 1475: When the verdict against me / us breaks with Norwegian law, then the courts have played out their credibility! No. 1475: When the verdict against me / us breaks with Norwegian law, then the courts have played out their credibility! When the verdict against me / us breaks with Norwegian law, then the courts have played out their credibility! Picture of my lawyer Knut Magne Howlid. 1 Cor. 6. 1. Do any of you watch when he has a case against his neighbor, then seek judgment with the unjust and not with the saints? 2 Know ye not that the saints shall judge the world? and if the world be judged by you, are ye then unworthy to judge in the least? 3 Know ye not that we should judge angels? how much more in temporal things! 4 So then, when you have matters about temporal things, put them to judges who do not regard anything in the church! 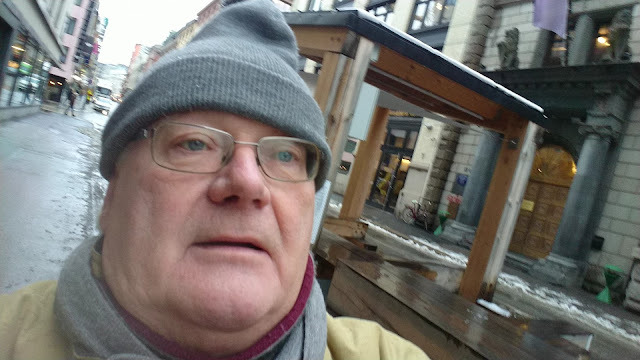 We read here in the scripture that if any believer is bringing a case against other believers like Jan Aage Torp opposed me because he hated my preaching against remarriage. Then he is not in God's will with his life and follows the Lord. But this is not what I should emphasize in this article, this was just as a parenthesis. It is that we read in the word of God that we, as believers, will be judging the whole world, even the angels and all other creatures. Therefore, it is quite obvious that Satan wants to draw us believers to justice and judge us when Satan has always been one who will imitate what God does and has promised in his own word. It is strange that I / we have now been in three court cases. Not one of them has been necessary or we have made near any criminal offense, but Satan and the dark forces love this game. Why? Because he will always imitate God and draw us believers into the courtrooms. In this way, Jesus and the first Christians experienced it constantly. We read through the entire Bible, even in the GT and even more in the NT that all who followed the Lord would stand in different courts. Although they had never done anything criminal or a "fly" mischief! "When the verdict against me / us breaks with Norwegian law, then the courts have played out their credibility!" In the guidance given to Christensen, nothing was mentioned about the consideration of small house buildings e, only that Christensen's wall would be like the other walls in the immediate area. Aubert Lange guided out from other people's house in Stormyrveien. When he writes that "this is not probable that the municipality has given consent to a wall of this size, placed in a regulated road surface." Then this is the lie of the century, that's the crazy frenzy he writes. Of course, I was told that it was not mandatory to build on top of an old wall. Finished work! When, as here, we have built something that is aesthetically pleasing, does not prevent anyone. And the Government Attorney wants this to be removed, who is behind this? For me, it is not difficult to know, of course, the forces of darkness are out on the road, nothing else!